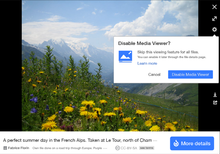 Welcome to the help page for Media Viewer, a multimedia browser for Wikimedia sites. This page includes frequently asked questions about key features of this project. 1 What is Media Viewer? 3 How can I use Media Viewer? 4 How does Media Viewer work? 5 How can I bypass Media Viewer? 6 How can I turn off this feature? 7 How can I re-enable this feature? 8 How can I view an image without enabling Media Viewer? 9 How can I close Media Viewer? 10 How can I view more information? 11 How can I browse through a collection of images? 12 How can I enlarge an image? 13 How can I view an image in full-screen? 14 How can I view images in different sizes? 15 How can I download an image? 16 How can I share an image? 17 How can I embed an image on another page? 18 How can I tell if an image can be re-used? 19 How can I edit, curate or discuss an image? 20 How can I link to an image from Wikitext? 21 How can I disable Media Viewer for unrelated images? 22 Which platforms does Media Viewer support? 23 Which file formats does Media Viewer support? 24 How can I report a technical issue? 25 How can I discuss new features for this tool? 26 Where can I find technical information about Media Viewer? 27 How was Media Viewer tested and released? 28 What new features are being planned for Media Viewer? 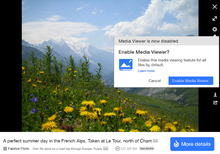 Media Viewer is a new multimedia browser that aims to improve the viewing experience on Wikipedia and Wikimedia sister projects. It lets you view images in larger size, with useful information about their contents, authors and related metadata. It also offers a number of tools to share, download or embed media files. This tool was developed by the Wikimedia Foundation's multimedia team. To learn more about Media Viewer, read below or visit this product page. How can I use Media Viewer? To open an image in Media Viewer, click on its thumbnail on any article, gallery or category page. This will display a larger image in Media Viewer, as long as the tool is enabled. Media Viewer is now enabled by default on all Wikimedia sites, but can be disabled by any user, as described below. From a file description page, click on "Open in Media Viewer" below the image to view it with this tool. When you click on a thumbnail in an article, a large version of the image appears in Media Viewer's ‘light box view’, right over the page where you clicked. Learn more about these features below. How can I bypass Media Viewer? Shift+Click – Open the file page in a new browser window. Ctrl+Click – Open the file page in a new background tab. Ctrl+Shift+Click – Open the file page in a new foreground tab. Note that mouse and keyboard shortcuts may vary depending on your browser and user configuration. For more information, check your browser support pages, such as these: Chrome, Firefox or Internet Explorer. To disable Media Viewer, click on the 'cogs' icon at the top right corner of Media Viewer, below the full-screen control (see screenshot). Then click on "Disable Media Viewer." From now on, images will no longer open in Media Viewer: clicking on thumbnails will take you to the file description page on Wikimedia Commons or other file repository. This Disable feature works for registered users (using a site preference), as well as unregistered or 'anonymous' users (using a file stored locally on your computer). Note that this Disable feature only works on the site where you activate it: disabling Media Viewer on Wikimedia Commons will not disable it on your home Wikipedia or other sister projects. If you are a registered user, you can also disable Media Viewer in your "Preferences": select the "Appearance" section, and uncheck this option under "Files": "□ Enable Media Viewer". Once you click "Save", images will no longer open in Media Viewer for your account on that site. Registered users can also disable Media Viewer on every wiki by adding mw.config.set("wgMediaViewerOnClick", false); to their global.js file. If you change your mind and wish to re-enable Media Viewer, follow the instructions below. If you have turned off Media Viewer and wish to re-enable it, visit any file description page on the site where you wish to use this tool. Then click on the 'cogs' icon next to the "Open in Media Viewer" button below that image: this will open it in Media Viewer, with the Enable panel open (see screenshot). Now click on "Enable Media Viewer". This Enable feature works for registered users (using a site preference), as well as unregistered or 'anonymous' users (using a file stored locally on your computer). If you are a registered user, you can also re-enable Media Viewer in your "Preferences": select the "Appearance" section, and check this option under "Files": '[ ] Enable Media Viewer’. Once you click "Save", images will open in Media Viewer again for your account on that site. How can I view an image without enabling Media Viewer? If you have turned off this feature but wish to view an image in Media Viewer without re-enabling the tool permanently, visit its file description page. Then click on the "Open in Media Viewer" button below that image: this will open it in Media Viewer, but only for that image at that time. Note that you can sometimes open an image in Media Viewer without enabling that feature by clicking on a link that includes the Media Viewer parameters at the end of the URL (e.g. : '#mediaviewer/File:foo.jpg'). How can I close Media Viewer? In some cases, you can also click on the ‘Back’ button on your browser to go back to the page where a Media Viewer image was linked. How can I view more information? Media Viewer shows basic information on the image you are viewing, right at the bottom of the screen. This includes the file caption or description, as well as the author, source and license information. Styling of the caption may be limited. The current markup is currently allowed: a, span, i, b, sup, sub. If you would like even more information, click on the big blue 'More details' button, which lets you view the file description page on Wikimedia Commons or other file repository. How can I browse through a collection of images? To browse through all the images in a collection, you can use the 'Next' and 'Previous' arrow buttons, which appear to the left and right of images in Media Viewer (see thumbnail to the right). A collection can include all the images in an article, a gallery or a category page. You can also use the left and right arrow keys on your keyboard for this feature. How can I enlarge an image? This will open the original image in its largest size, on Wikimedia Commons or the file repository site where it was first uploaded. You can then use your browser zoom feature to examine details of the image, or right-click it to use this file in a variety of ways. In this view, the Media Viewer controls disappear completely, so you can interact the image directly. To view the image in Media Viewer again, simply click the 'go back' button in your browser. How can I view an image in full-screen? To see an image in full screen, click on the full screen button at the top right of the Media Viewer panel (the icon with two opposing arrows - see icon to the right). This will show a large image across your entire screen, not just the browser window. This full-screen view is completely uncluttered, so you can focus exclusively on the image, with no other distractions. 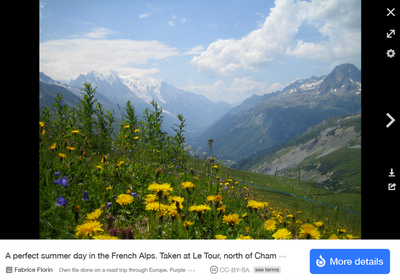 In this mode, you can hover over the image to see the controls, the file caption, author, source and license. How can I view images in different sizes? To view images in different sizes, click on the ‘Download’ button (the down arrow icon at the lower right corner of the screen). This opens the ‘Download' panel, with the original image size pre-selected. To pick a different size, click the down arrow in the green Download button, and select the size that best fits your needs (e.g. Original, Small, Medium or Large). Then click on 'View in browser' below the green button to open the file at that size, in a separate tab. How can I download an image? To download an image, click on the ‘Download’ button (the down arrow icon at the lower right corner of the screen). This opens the ‘Download' panel, with the original size pre-selected. Click on the green button to download that original file, using your browser’s tools. To download an image in a different size, click the down arrow in the green Download button, where you can pick the size that best fits your needs (e.g. Original, Small, Medium or Large). Then click the green button again to download that image size. You can also preview any of these sizes, before you download: click on 'View in browser' below the green button to open the file at the selected size. Please check the license terms of a file before downloading it for your use, to confirm that your use is covered. Also, please include all required attribution and license credits to comply with those terms: these credits are now included in the Download panel, under 'You must attribute the author'. Click on that label to get the full credits, which you can copy and paste in either plain text or HTML. How can I share an image? To share images you find in Media Viewer, click on the ‘Share / Embed’ button (the curved arrow icon at the lower right corner of the screen - see icon to the right). The 'Share' tab is shown first, and includes show a link to the selected image, which you can copy and paste to share it with your community. Note that for now, this link will open the image in Media Viewer on its file repository page (e.g. Commons), not on the page where you found it. How can I embed an image on another page? To use an image on another wiki page or website, click on the ‘Share / Embed’ button (the curved arrow icon at the lower right corner of the screen - see icon above). Then click on the 'Embed' tab. This will show the code needed to display the selected image, which you can copy and paste into your page’s code. To add an image on a wiki page, select ‘WikiText’. To include it on a standard web page, select ‘HTML'. The required attribution and license info is included in the HTML code, along with corresponding links. A size selector lets you pick the size that best fits your page. Note that you can also change the width or height of an image in the code itself. Please check the license terms of a file before embedding it on a page, to confirm that your use is covered. Also, please include all required credits and links to comply with their license terms. How can I tell if an image can be re-used? Many of the images you find in Media Viewer can be re-used freely, as long as you provide attribution and comply with their license terms. For example, some images are licensed under Creative Commons terms (e.g. CC BY or CC BY-SA). Others are public domain or available under some other license. To find out what these license terms mean, simply click on the license label at the lower right of Media Viewer, right below the blue 'More details' button. In some cases, it will show you the license details on the Creative Commons site. In other cases, it will show the license in in the metadata panel -- or it will go to the file description page on the repository site, where you can learn more. If an image has special licensing terms or requires special credits or permissions, a ‘view terms’ link will be added next to the license label. Click on it to see the permission details and special requests from the author or source. How can I edit, curate or discuss an image? To edit, curate or discuss an image, go to its file description page on Wikimedia Commons or other file repository. You can do this by clicking on the big blue ‘More details’ button, at the lower right corner of the screen. A site icon in the 'More details' button shows whether it links to Wikimedia Commons or another file repository (indicated with a 'W' logo). How can I link to an image from Wikitext? Clicking on this link will open the linked image in Media Viewer, as an overlay covering the linked page. How can I disable Media Viewer for unrelated images? Sometimes, Media Viewer displays images that are confusing or not suitable for viewing with this tool. If necessary, editors can prevent these images from appearing in Media Viewer, using one of the methods below. <span class="metadata">[[File:Foo.jpg]]</span> Please only use this method to mark elements in articles that are considered not to be part of the proper content of the article: annotations, maintenance templates, navigation links, media controls, etc. Media Viewer is not the only tool that ignores content marked as metadata. For images that are used to link to another document, using the |link= image parameter, you don't need to do anything; Media Viewer will ignore such images automatically. Which platforms does Media Viewer support? Media Viewer works on most modern web browsers for desktop computers: Chrome, Firefox and Safari's latest stable versions -- as well as Internet Explorer versions 9 and above. At this time, Media Viewer does not work on IE8 and below, and it is disabled for mobile devices (a simple media viewer is now provided for mobile devices, but lacks most of the features of the desktop version). In future releases, we plan to provide a mobile version of Media Viewer, as well as wider browser support on desktop platforms. Which file formats does Media Viewer support? At this time, Media Viewer only supports the most widely used image file formats on Wikimedia sites (e.g. : JPEG, GIF, PNG, TIFF, SVG). In future releases, we will add support for PDF, audio, video and other file formats. We welcome bug reports from our community. If you find a technical issue, please file a bug here on Phabricator. How can I discuss new features for this tool? Please let us know what you think of Media Viewer. You are welcome to participate on this discussion page. Tens of thousands of users around the world helped test Media Viewer during its development. Here are suggested improvements collected through community consultations, user surveys and other feedback they kindly shared with our development team. Many of these improvements have now been implemented. Where can I find technical information about Media Viewer? For more technical information about this tool, visit these two extension pages: MultimediaViewer and CommonsMetadata on MediaWiki.org. How was Media Viewer tested and released? Media Viewer was tested extensively for about nine months by tens of thousands of beta users around the world, starting in November 2013, as part of the Beta Features program. This allowed users to enable Media Viewer long before it was released on their sites, by clicking on the small 'Beta' link next to 'Preferences' in their personal menu. We also conducted rigorous usability studies throughout development, such as this recent usability test -- and ran extensive user surveys with over 18,000 responses in 8 different languages. Additional community suggestions were collected through this widely promoted community consultation on many large wikis around the world, as well as as our regular talk page. After addressing key issues identified by our testers, Media Viewer was gradually released between April and June 2014. Local deployments took place on different sites every week, through the middle of June 2014, when this feature was enabled by default on all wikis hosted by the Wikimedia Foundation. We then asked for more community feedback and did another round of improvements based on new suggestions, as outlined above. For more information, check out this release page. What new features are being planned for Media Viewer? No new features are planned for Media Viewer at this time. In fall 2014, the multimedia team developed a wide range of new improvements, based on usability research and community feedback. If you have any suggestions for improving this tool in future releases, please let us know on this discussion page. This page was last edited on 17 February 2019, at 04:06.